Every year we call the day after Thanksgiving Black Friday. It’s not technically a national holiday—although many companies give people the day off, there is mail delivery and federal offices are open—but like St. Patrick’s Day and Super Bowl Sunday, a great many Americans celebrate the day with time-honored rituals, because Black Friday marks the start of the Christmas shopping season. Some people start the day the night before, camping out in line at stores, so they’ll be ready to trample one another in the rush to get sale items less than 24 hours after sitting down to give thanks for what they already have. Now many people get a jump on it as stores open up on Thanksgiving, providing even more irony as their underpaid employees have even less to give thanks about. I thought the name Black Friday was to acknowledge the deaths of people killed in these big sale events, but it’s a name originally given by retailers to mark the day each year that they expect their sales to finally exceed their expenses, putting them in the black. As a Bernie Sanders-type Socialist, I’m not a very good American consumer, and it gets even harder for me to think about shopping when the internet slows down and my email box gets so clogged with junk about buying, buying, and more buying. None of the enticements stands out, and with so many, they all meld into one amorphous mass that I wish would disappear. But instead of griping, I’ve decided to mark Black Friday as the day I think about all the wonderful things on this planet that belong to everyone, are absolutely free, and you don’t have to stand in line or trample anyone to enjoy. The main thing I’m grateful for, of course, is the chickadee. Right now I have over a dozen visiting my yard every day. They take sunflower seeds, suet, peanut butter, shelled peanuts, and mealworms. I offer the mealworms strictly by hand, and so the moment I appear at the window, they crowd in. Of course the mealworms themselves cost good money, as do the food items I put in my feeders, and the feeders themselves, though Russ built a few of them from scrap wood. The digital camera, telephoto lens, camera accessories, and computer equipment I use to photograph and disseminate information about those chickadees were extremely expensive. Russ and I use the fruits of our labor to pay for our necessities and for some pretty cool luxuries. 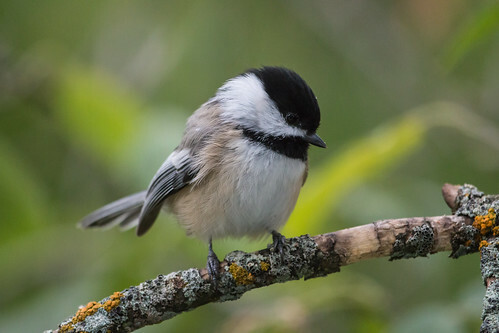 But the chickadees themselves—the one thing more than anything that enhances my quality of life—are absolutely free, in both the monetary sense and the sense of what real freedom is all about. Each individual chickadee is resourceful and hardy. Chickadee flocks share their good experiences, keep one another safe by calling out important warnings, work hard to build up their own personal food stores but allow others to raid them if something bad happens to the other’s own food stores, and are reasonably trusting while being reasonably prudent and cautious. 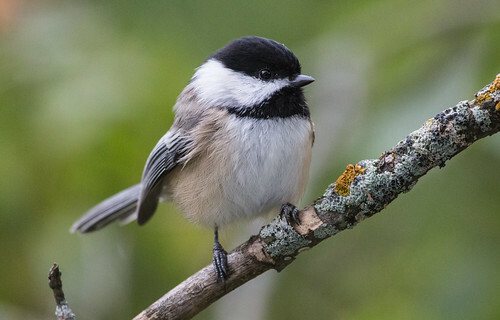 I don’t know if chickadees are as cheerful as they make me feel, but they get up at first light every morning and deal with the worst that Mother Nature can dish out with equanimity. I used to say that chickadees don’t ask anything of us, but since I started handing out mealworms, I can clearly see that they do know how to alight on my window frame and tap at the glass to get my attention when they feel like eating a mealworm or two. I don’t know if they’re actually asking me for it or have simply figured out how to get that alien species to come over to the window and hand them their due. Whether they have me trained, or I have them trained, or we’ve both learned how to enjoy the best of what the other can offer doesn’t matter. Feeling those scratchy little toes in my hand every day fills me with real joy and reminds me that the best things in life really are free. Beautiful post, Laura. Thoughts worth bearing in mind, and definitely in need of sharing. Thanks!